Outdoor Pergola - Who Has The Best Outdoor Pergola? 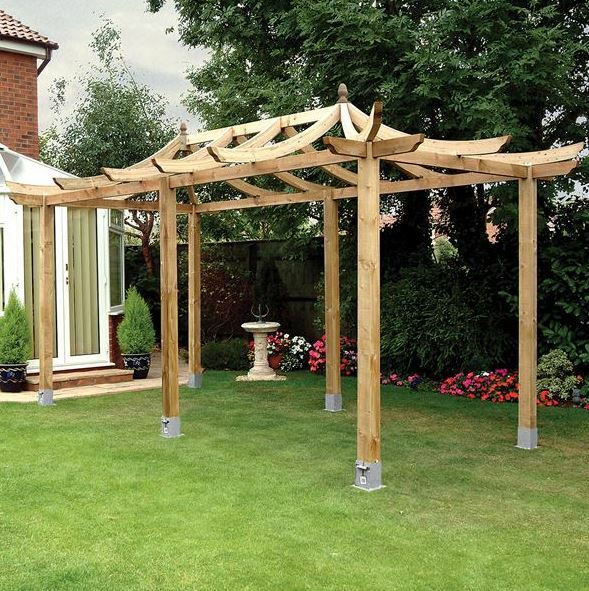 An outdoor pergola can make a very decorative and useful addition to any garden. As well as being an ideal place to grow climbing plants upon, it can also act as a shaded area on hot, sunny days, as well as a centre piece for your garden to impress guests and neighbours. It’s little wonder then that outdoor pergolas are becoming increasingly common, which is why WhatShed have created this handy guide to help you find the model that’s perfect for you. We’ve passed over run of the mill models, so you won’t find pergolas whose looks and performance are distinctly average. We have, however, found 15 outdoor pergolas that have something special that elevates them above the majority of their competitors, and you’ll find them all here in our league table. For the purposes of our league table, we’ve defined an outdoor pergola as one that stands alone in a garden, rather than models that are attached to a house. We’ve then considered the price, and the value for money it provides compared to its size. 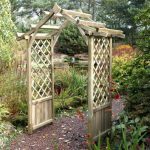 Pergolas can be very beautiful garden buildings, so of course we’ve also considered the looks and aesthetic appeal of each one we’ve reviewed. 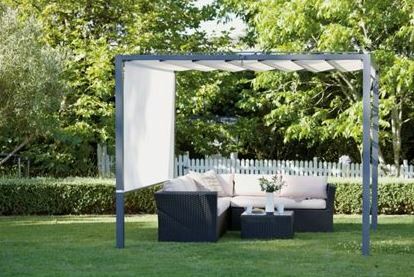 In this way, we’ve found the number one outdoor pergola that can be bought online in the UK today, as well as fourteen high quality runners up. Our outdoor pergola league table has provided a very diverse group of garden structures, but we’re pleased to have found pergolas to suit all budgets and to fit gardens of all sizes, with the one unifying factor being high quality. 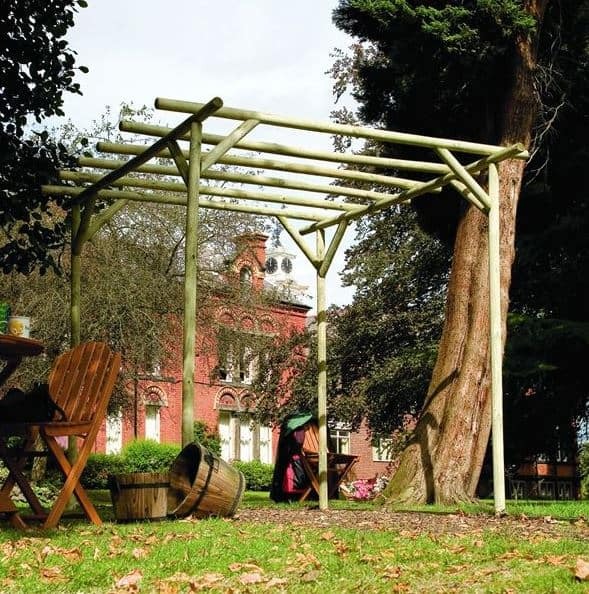 Congratulations to the Arbour-Plus Florence pergola with panels, which through being versatile, durable and attractive, as well as offering very good value for money, takes the accolade of being the best outdoor pergola available to buy online today. Whether you want an open or covered pergola, or a timber or metal workshop, WhatShed will continue to bring you the independent reviews that can answer all your questions. This outdoor pergola earns its spot at the very head of our league table, by bringing with it lots of exciting and value adding features. 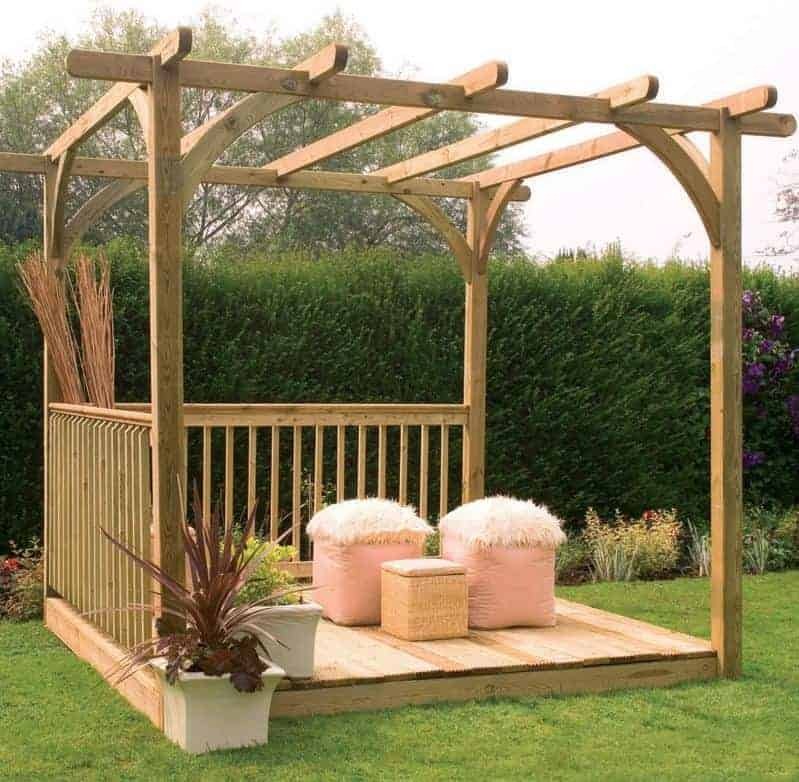 In effect, it’s a pergola that’s combined with a gazebo and that versatility also means that it offers exceptional value for money for a price tag of around five hundred and fifty pounds. At the centre of it is a rectangular open topped pergola that offers plenty of room for climbing plants to take hold thanks to two slatted panels on the roof, but this is also accompanied by two trellised panels. We were pleased to see that these panels can be moved around, so that the final structure can be tailored to make the most of each individual garden. With a base area of 3.04 x 2.44m, there’s a large area underneath the pergola as well, and we found it more than big enough to situate a dining table and chairs. With these in place, it becomes the ideal place to have an al fresco meal on a summer evening or to entertain guests. We were glad to find that all the timbers have been pressure treated as well, which means that they come with a 15 year warranty against rot. If you’re looking for a reasonably priced outdoor pergola that offers a little extra, then this could be the one for you. An outdoor pergola can be a very useful garden structure, particularly if you like the natural beauty of climbing plants. A deck can make a great addition to a garden as well, providing a tough and durable area to relax on or to use as a location for a barbecue. This smart building combines a pergola with a deck, and the result is a great value structure that provides the benefits of both without taking up two areas of space in the garden. 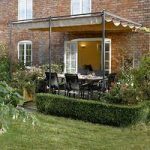 It’s this sheer versatility, along with a unique look different to any other outdoor pergola that we’ve reviewed that takes it to the number two spot in our league table. The structure as a whole measures 4.88 x 2.44m, meaning that there’s lots of space to move around in. The outdoor pergola section takes up the left hand side of the structure and leads directly onto the deck. 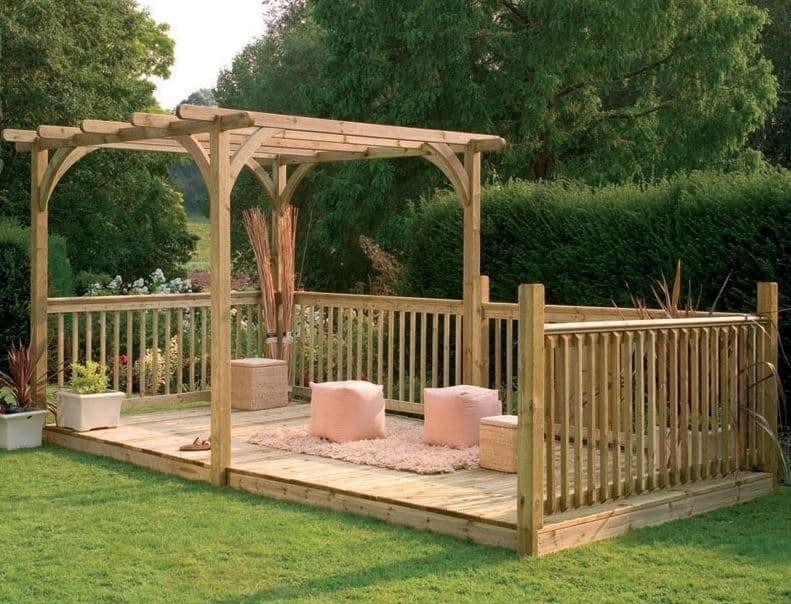 We feel that the two sections complement each other well, both being made of planed and pressure treated softwood timbers that come with a 15 year guarantee, and this will look even more impressive with plants growing around the pergola. If you’ve been thinking of buying both a deck and a pergola it makes sense to combine the two in this way, and get better value at the same time. Traditional Japanese gardens have for centuries been among the most beautiful in the world, so we were pleased to see that their striking looks have been used as an inspiration for this very eye catching outdoor pergola. From the moment we saw it we knew that this was a very high quality garden structure, and it’s certainly among the most attractive buildings that we’ve seen. When combined with high quality components that give it excellent durability, this was enough to elevate it into third place within our league table of the very best outdoor pergolas available online today. Another factor in its favour is that this is the largest outdoor pergola we’ve reviewed, setting aside the pergola and deck combination above, with a base size of 3.40 x 3.60m, so there’s more than enough room for garden or dining furniture. At the back is a trellised panel which is ideal for climbing plants, and then above it is the feature we liked most of all: the oriental style roof modelled on a traditional Japanese tea house. With attractive shingles covering the curved slopes of the roof, it’s very weather resistant as well, as are the pressure treated timbers underneath and around it which all come with a 15 year guarantee. Whilst some pergolas, as is the case with the tea house model at number three in our league table, are beautiful garden buildings in their own right, others come to life fully only when they have plants growing upon them. That’s the case, we feel, with this colonnade outdoor pergola, but even in its bare form it still has the magic touch that lifts it above the ordinary. We particularly liked the curved roof, and as once again all the timbers have been pressure treated you can be sure that it will keep its simple yet strong looks for many years to come. We also liked the way that this outdoor pergola has been given a walkway style, with a width of only 1.80m but a length of 4.80m. That makes it ideal to position along a pathway and that’s why we can imagine it becoming a much loved and talked about garden feature, as well as a practical source of shade and a place to grow plants. We were pleased to see that it comes with bolt downs to make it easy to attach to a level garden surface, and once in place it feels very stable even in windy conditions. 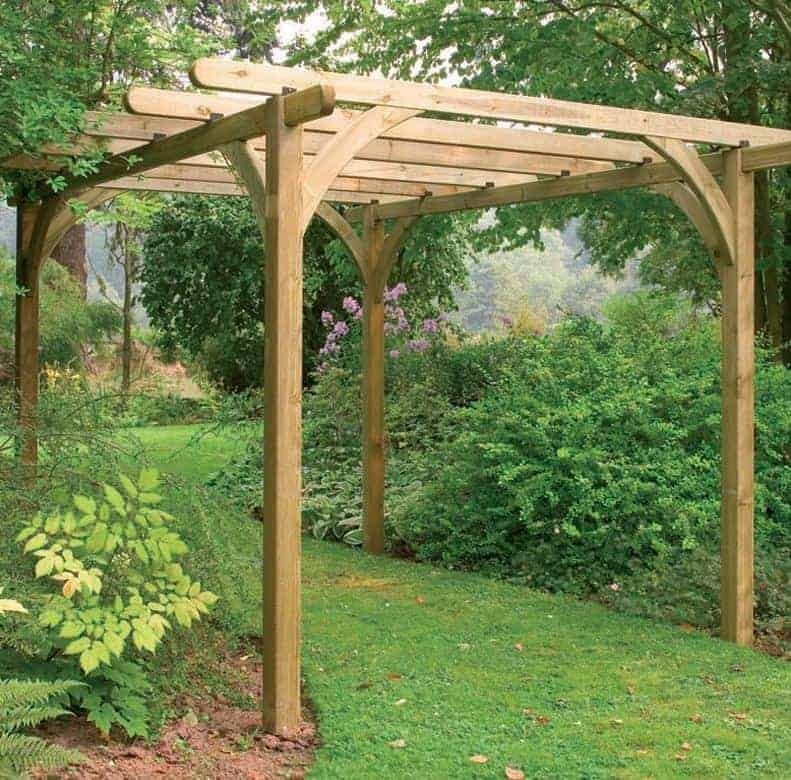 It’s a value adding feature that we don’t always see, and with a low price already attached for such a long pergola this is enough to help it into the upper reaches of our league table. When you mention an outdoor pergola, many people think of the rectangular design that has been gracing British garden’s for decades now, and whilst these can be very functional we always like to see models with a more daring design. That’s just one reason why we were so taken with this radial pergola from Arbour-Plus. It’s effortlessly stylish, and so we can imagine it being a big hit with people who take a long time to ensure that their garden looks just right. 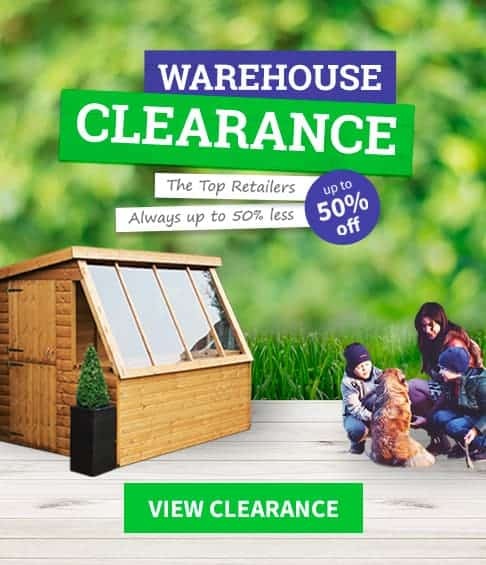 It’s also incredibly good value for money, with a price tag of less than two hundred pounds for a nine foot pergola, and these factors ensured its place within the top five of our WhatShed league table. What makes this different to most other pergolas that we’ve reviewed is that the horizontal struts radiate out of a central point and create a quarter circle that’s 2.49m above the ground. Even in its bare unadorned form we found this very pleasing on the eye, but it’s also ideal to have plants growing up and across it, or even to have hanging baskets coming down from it. We were also pleased to see that not only was the timber pressure treated, which we wouldn’t normally expect from an outdoor pergola as affordable as this one, but also that the timber used had been slow grown to give it extra strength and resilience. Whilst this outdoor pergola is very different to the tea room pergola we reviewed earlier, it still tips its hat to Japan and in doing so becomes an original and attractive garden structire. It’s the bowed rafters that give it the eye catching dragon styling, and yet they also make an excellent place to grow and display plants. Once this natural canopy is in place it will also make an excellent shaded walkway, thanks to its extended length of 4.80m to go along with a base width of 2.70m. 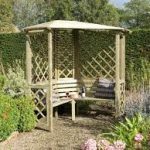 This then is an outdoor pergola that fulfils all three of the main functions we look for, in that it can be used to grow plants, provide shade, and is attractive enough to be an eye carching garden feature. It’s also very durable and weather resistant thanks to the initial pressure treatment used by the manufacturer, and which again means that it comes with a reassuringly long warranty period against the threat of dry rot. What we particularly liked about this pergola is that it comes not only with bolt downs but with spikes too, which make it very easy to site within a garden landscape. For this reason, it’s an ideal pergola for those who live in an area that can be exposed to strong winds, and who therefore need extra stability in their garden buildings. This is the first garden arch style outdoor pergola to feature in our list of the best models available online in the UK today. 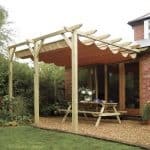 They offer a different proposition to many larger pergolas in that they’re not designed to act as a place to sit down underneath or to act as a place to hold a barbecue or dinner party. 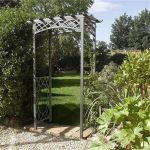 On the other hand, they provide a very attractive garden structure at a very affordable price, and in our opinion this is the best example of that of any arch pergola that we’ve reviewed. For just a little over two hundred pounds, this is certain to attract compliments from everyone who sees it, and it gains extra functionality by being unusually large for an arch at 2.70 x 1.36m with a peak height of 2.45m meaning that there’s lots of headroom for people passing beneath it. We liked the way that two trellised panels had been used for the sides, as this creates an ideal growing environment for garden plants. We were also impressed with how easy this outdoor pergola was to assemble, as we know that the thought of putting a garden structure together can seem daunting for people who aren’t used to it. 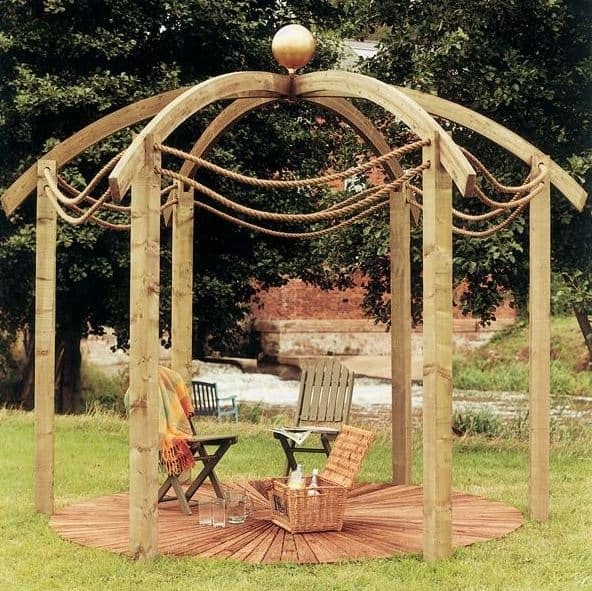 If you’re looking for a decorative and practical pergola on a small budget, this deserves to be added to your shortlist. Whilst every outdoor pergola that features in this league table is designed to stand alone in a garden environment, that doesn’t mean that they have to be positioned centrally. This model from Kinlet, for example, is designed to be situated in the corner, and we feel this brings real advantages for those who have smaller gardens. Even if there’s a scarcity of room in the centre of the lawn itself, this can fit neatly into a corner, saving space and yet still performing as a good looking and useful plant growing structure. A latticed upright has four rounded and planed rafters radiating out from it, and these are in turn held up by a strong frame. The rounding of all these timbers not only gives them extra strength it also makes them even more visually attractive, and we were pleased to see again that they had all been given an initial pressure treatment that forces wood preserver deep into their fibres for long lasting protection against rot. 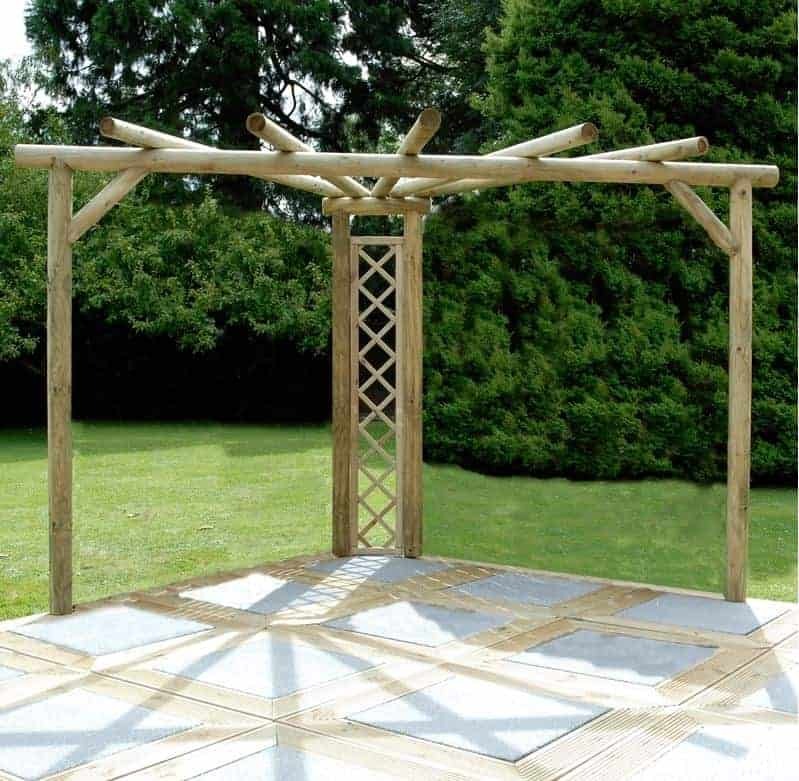 Whether you’re growing roses or ivy, we feel this will make a good looking support structure for them that will beautify your garden in its own right, and we also think it represents good value for money for its size of 3.00 x1.80m. Once again we have an outdoor pergola from Deck-Plus that has been allied with a tough set of decking. Unlike the model which is placed at number two in our league table however, the pergola extends across the whole of the structure. This means that the building as a whole is half as long as its stablemate, and therefore in our opinion it offers slightly less value for money; we do still find the price very reasonable, however, given how well built and durable this pergola is, as exemplified by the 15 year warranty attached to it thanks to the pre-delivery tanalisation. This truncated form gives it a very different appearance to the 16’ x 8’ model, and yet we feel that this would be a more suitable and fitting option for people who only have a compact garden. Once again there’s a traditionally styled rectangular pergola sitting upon a softwood deck. This creates a strong and durable base for the outdoor pergola to be based upon, and also helps to give the uprights extra protection against the threat of ground moisture. We also found that the balustrades around two of the sides added an elegant touch, and we feel this would be a good place to entertain a party of one or two guests on a warm evening. This is the first covered pergola to feature in our league table, and also the first one not to be made of timber, and yet by breaking with tradition we feel that this outdoor pergola has a lot of benefits to offer that we don’t find in the majority of pergolas we review. First among these is that it’s a virtually no-maintenance garden structure. The square frame is made of steel and aluminium, and the panelled roof is made of white polyester. This means that there’s no need to worry about rot or rust, and no need to spend precious time topping up the wood preserver treatment. What made this stand out even from other covered pergolas is that the cover can easily be adjusted when in place. This is done by the use of a simple rod similar to that found in sets of blinds. 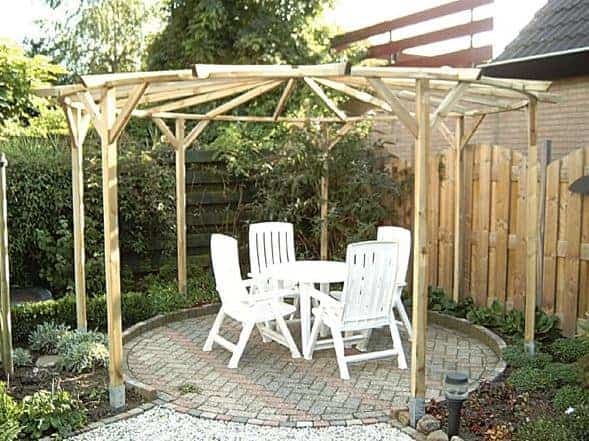 In this way, the owner of this outdoor pergola can decide whether they want the cover closed as protection against the rain or as shelter from the sun, or whether they want it open. At 2.95m wide and deep this also offers a considerable amount of space underneath the roof for what is a relatively low price, and this is another factor which has helped this particular garden structure earn a place within our top ten. As we’ve already seen in this league table, an outdoor pergola can be a thing of beauty and have an intricate design, and yet some people prefer the simpler things in life. For those who prefer the traditional rustic charm of a classical garden, this particular pergola could be just what they’re looking for. It takes the traditional four sided open topped pergola that we’ve seen many times before, this time over a base area of 2.40 x 2.40m with a height of 2.52m. What we particularly liked about it however, and this is what lifted it above the ordinary and into our top fifteen alongside the very low asking price, is the attention to detail that’s been paid to what is on the surface a very straight forward structure. Firstly, all the timbers have a slightly greenish tinge to them which is a welcome sign of the pressure treatment that’s been applied. We would recommend that a further stain is applied as well to give the timber protection against the sun’s UV rays, although some may prefer to create an even more rustic look by letting the wood fade to a silver hue. We were also glad to see that all the timbers had been rounded, which isn’t something we always see on an outdoor pergola. This is great for vines and ivy to wind themselves around, and it also helps to create a very solid and stable structure. From the cheapest, and possibly plainest, outdoor pergola in our league table we move to something altogether different. This ornate pergola could easily be used as a garden feature or even statue, and the mark of quality is that the late, great garden designer Jac Flower is the creative behind it. If you’re looking for a pergola that will look different to those of your friends, and that will catch the eye the moment anyone walks onto your property then this is one for your consideration. It’s also a good choice for those who like to keep an eye on their carbon footprint, as all of the timber used in the construction is FSC certified and from sustainable sources. We were struck by its visual appeal at first sight, with six bowed rafters rising from solid timber uprights to meet in a central sphere. What really grabbed our attention, however, were the stylish ropes stretching between each rafter. These are highly decorative, and yet they also help to support climbing plants. 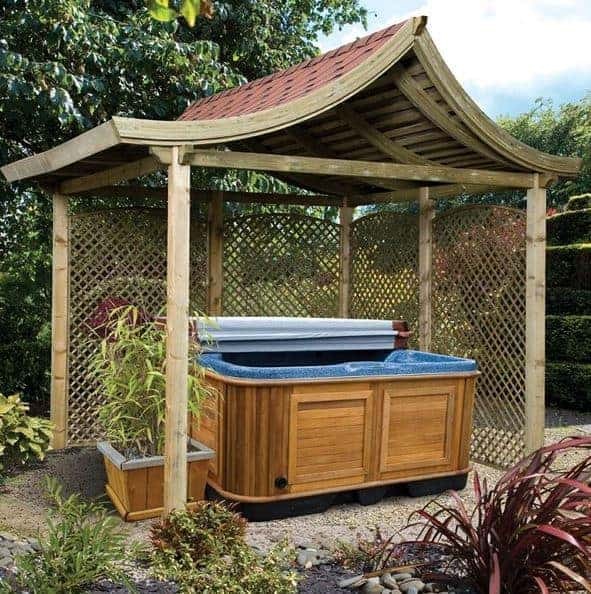 This combination of style and functionality is something that we really like to see in an outdoor pergola, and it helps this model enter our top 15 league table especially as it’s also significantly larger than most of the pergolas we review with a base area of 3.28 x 3.28m. Once more we have an outdoor pergola with a strikingly modern design that doesn’t forget its primary functions as well, and it’s only the fact that this is the third most expensive pergola in our league table that stops it from being placed much higher. If the price of nearly eight hundred pounds does fall within your budget, then, you may want to consider this before any other model, particularly if you have a modern home and garden and like to stand out from the crowd for all the right reasons. This outdoor pergola is based upon a circular design with a very accommodating base size of 3.45 x 3.45m. 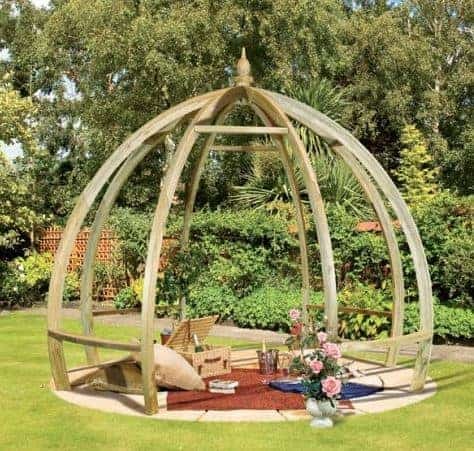 Four pairs of bowed arches lead to a central point, in the style of a space age pod, and we feel this would look very striking with plants growing upon them. As the peak height is 2.85m, this leaves a large circular base area which is ideal for garden furniture. Alternatively, it makes a great spot to have a picnic in, with the addition of a beach towel on the floor. This is a pergola like no other that we’ve reviewed, and yet it still comes with a 15 year guarantee against wet rot which is something that we always welcome. 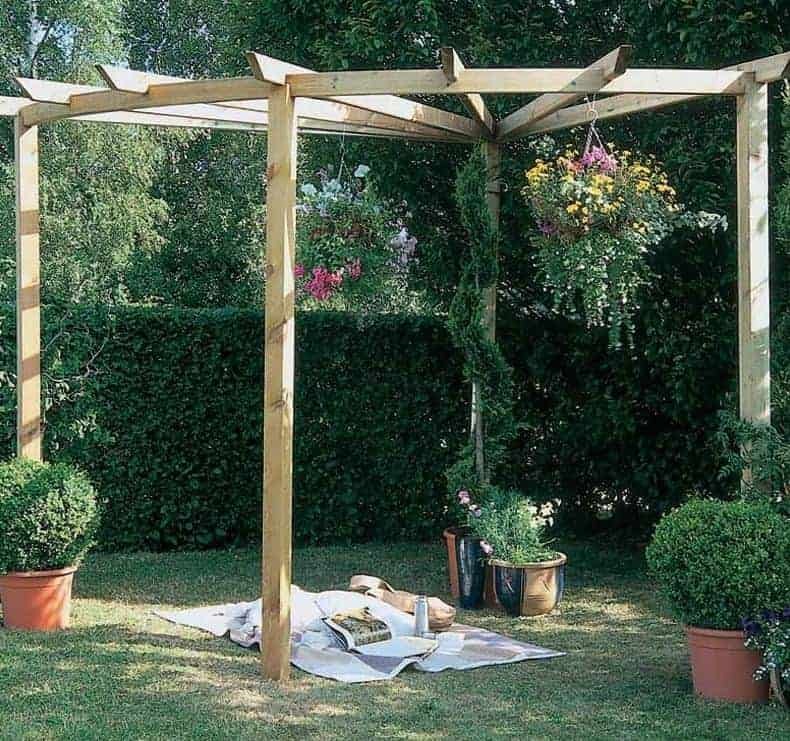 This is very much a traditional rectangular shaped outdoor pergola, which means that whilst it looks relatively plain in its original state it can be transformed with the addition of attractive climbing plants. There’s lots of timber for such plants to wrap themselves around, with six rafters across the open roof 2.80m above the ground. 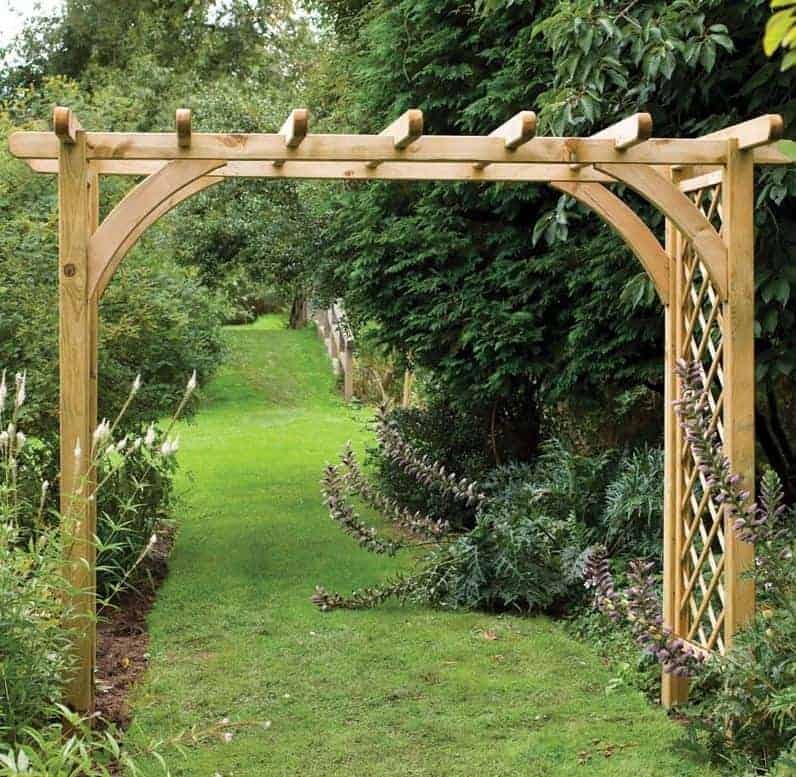 This is taller than most of the pergolas we’ve reviewed, especially when you consider the seven foot by seven foot base size which we feel makes this a good choice for a garden where space is at a premium. Whilst stylistically this outdoor pergola will never win any prizes, what made it stand out for us was the quality of the components used. The high quality timbers are FSC certified, making them ideal for greener gardeners, and yet they’ve been given a long lasting pressure treatment that brings with it the peace of mind of a 15 year manufacturer’s warranty. Whilst this is also true of the majority of entrants in our league table, it’s not true of all the outdoor pergolas that we see, especially at the budget end of the market as this one is. For that reason, it earns its place in our top fifteen league table and is a good choice for those who don’t want anything too ostentatious to detract from their lawn and plants. 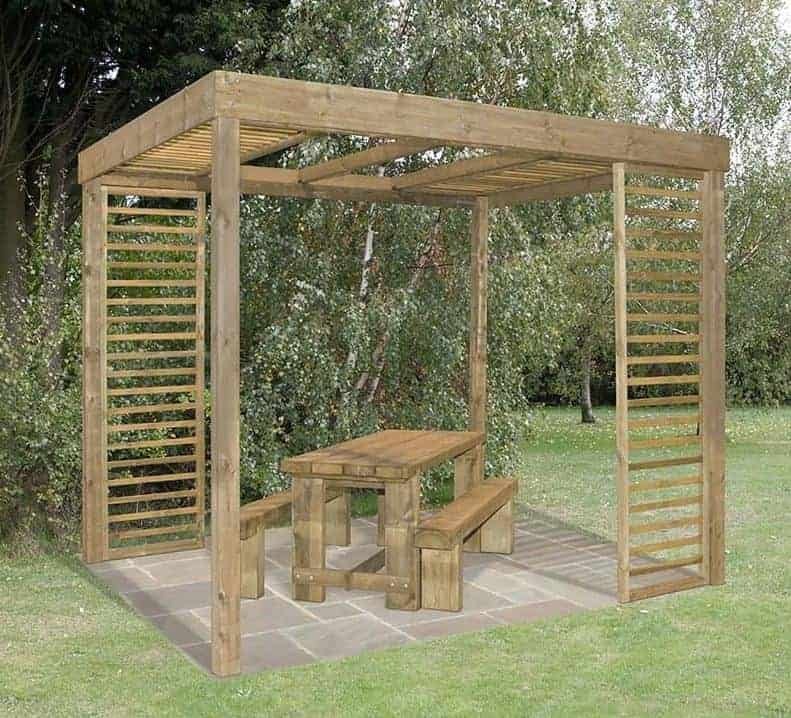 If you’re looking for an outdoor pergola that can take its place in the centre of your garden, and act as a place to entertain guests or simply to relax underneath on a sunny evening, this could be your perfect selection. Its circular design makes it different to any other pergola in this WhatShed list of the 15 best outdoor pergolas available online right now, and it’s a design that we found highly attractive, as well as providing lots of opportunities for the display of plants. 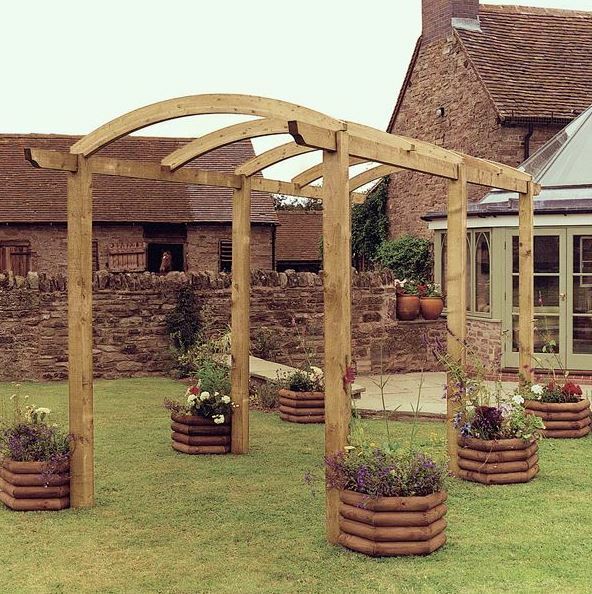 It’s also one of the larger pergolas we’ve reviewed, with a diameter of four metres or just over thirteen feet. You’ll be surprised at how many people you can fit underneath this outdoor pergola and even though it has seven timber posts it still presents an uninterrupted view of the garden surroundings wherever a person is seated. We were glad to see that the timbers had all been pressure treated, so they should prove to be durable without the need to carry out regular treatments upon them. We would have expected this to mean that it also came with a long warranty against rot as well, but unfortunately that was missing in this case and it’s this that prevents this highly original outdoor pergola from achieving a higher position.